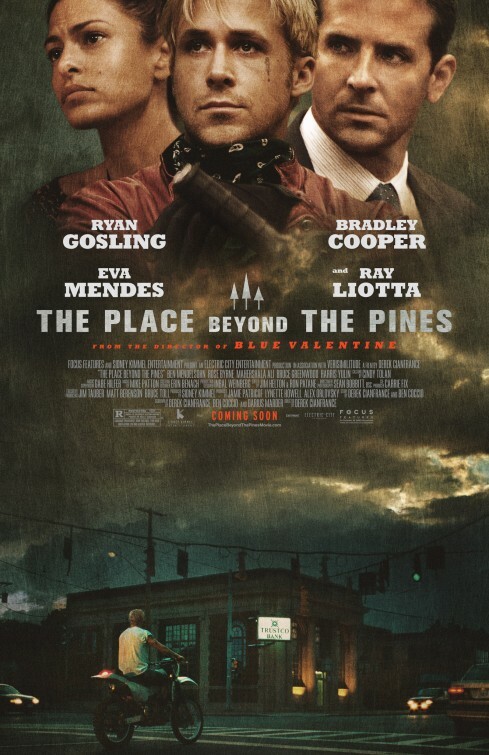 Critically acclaimed Blue Valentine director Derek Cianfrance’s absorbing and poignant three act family drama, The Place Beyond the Pines is almost Shakespearean in nature as the narrative delves into the psyche of contemporary masculinity and the legacy that men leave behind for their sons. That legacy is naturally shaped by the actions and deeds that a man did whose triumphs or sins will haunt the next generation. The film opens with a motorbike stunt sequence in a metal ball in which three stunt riders’ ride around in a seeming and noisy symmetry. Ryan Gosling (Drive, Gangster Squad) is introduced as Luke who as a down on his luck, tattooed stunt driver earns money at the local fairs in upstate New York, Schenectady to be exact. After a brief one night stand with a local waitress Romina played by Eva Mendes, the itinerant stunt rider Luke returns to the town a year later to discover that he has fathered a one year old son. Cash-strapped and desperate, he befriends a local two bit mechanic who says that the quickest way to make some serious cash is to rob a couple of local banks using his unique stunt riding skill set. Desperate to offer some form of financial support to Eva and his newborn baby, Gosling soon goes on a Bank robbing spree. After a serious of successful stints, one last job goes horribly wrong and Gosling’s fate as a man and a father gets inextricably tied in with a young and ambitious local cop Avery Cross, superbly played by Bradley Cooper (who really has excelled in the serious acting stakes since his remarkable Oscar nominated performance in Silver Linings Playbook). The Place Beyond the Pines is an intimately shot and skilfully directed study of masculinity by Derek Cianfrance and the intricate sprawling story line is both riveting and powerful as the actions of both men, Gosling and Cross reverberate for the next two decades. This is a brilliant piece of film noir assisted by a remarkable supporting cast including a wonderfully menacing performance by Ray Liotta as a corrupt cop Deluca and Dane DeHaan as Gosling’s confused but vulnerable teenage son Jason. Whilst the female characters are intentionally underwritten, it really is Mendes who excels in a grittier role as a mother who has to bring up a son whilst keeping a secret about his real father’s criminal past. 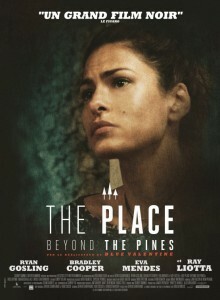 The Place Beyond the Pines is about legacy, betrayal, corruption, aggression and ambition in a small town American community which sees two men from opposite social spectrums both portrayed alternatively as victim and hero in the narrative who make the wrong choices for all the supposedly right reasons, only to have those choices impact their own son’s destinies. Cianfrance deserves an Oscar nomination for his gripping direction as he deftly captures the intensity and brooding atmosphere of small town America where every man is angling for a better life despite the consequences and their own circumstances. The Place Beyond the Pines is a highly recommended film which will firmly elevate Oscar Nominees Ryan Gosling and Bradley Cooper as two of the most promising actors of their generation. This gripping crime drama also stars Rose Byrne as Avery Cross’s wife Jennifer and Bruce Greenwood as District Attorney Bill Kilcullen. 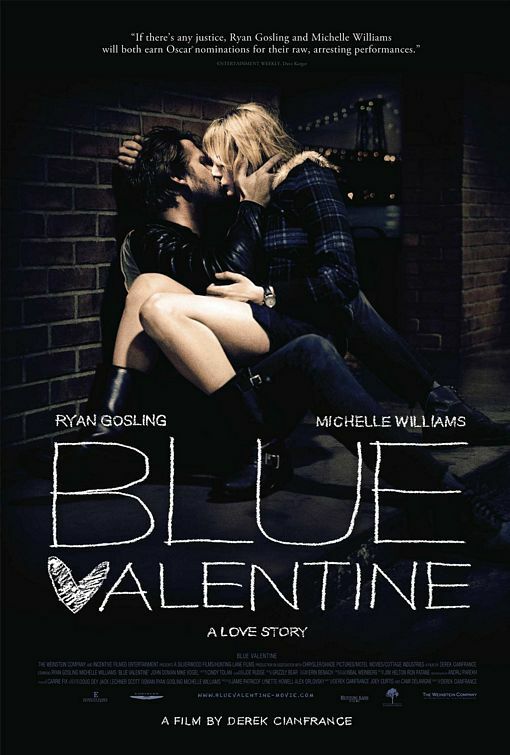 Blue Valentine is a 21st century Kramer vs Kramer anchored with a superb performance by Michelle Williams as Cindy, an aspiring doctor whose potential is thwarted by a sudden marriage to Dean, a slacker not too serious house painter. Set in suburban Pennsylvania, Blue Valentine is a depiction of a nonlinear disintegration of romance and marriage, made more intense by extreme closeup shots of Gosling and Williams as a young married couple whose love has clearly reached the end of its journey typified by a romantic night away from the domestic grind as a last ditch resort for their failing marriage. Cindy and Dean’s love for each other is clearly precarious as they check into the Future Suite at a tacky motel upstate, and in between various stages of inebriation try to arouse each other again to the same levels of intensity that characterized their early dating sessions. While Gosling is brilliant and evokes a similar performance to that of his Oscar nominated role in Half Nelson, it is Michelle Williams who maintains the emotional gravity of the film with a poignant, slightly gloomy and always quirky performance as Cindy, a woman who is desperate to avoid the marital pitfalls of her bickering parents. Blue Valentine is at times gloomy, deeply intense, but brilliantly acted and a must for viewers who appreciate independent American cinema.